“This one’s a keeper. What should we call it?” I asked my husband after our initial tasting of this shockingly pink cocktail, a classic gin-and-citrus shakeup made interesting with aronia berry simple syrup. “Nothing about this drink is duck-like,” I argued, and took another sip. 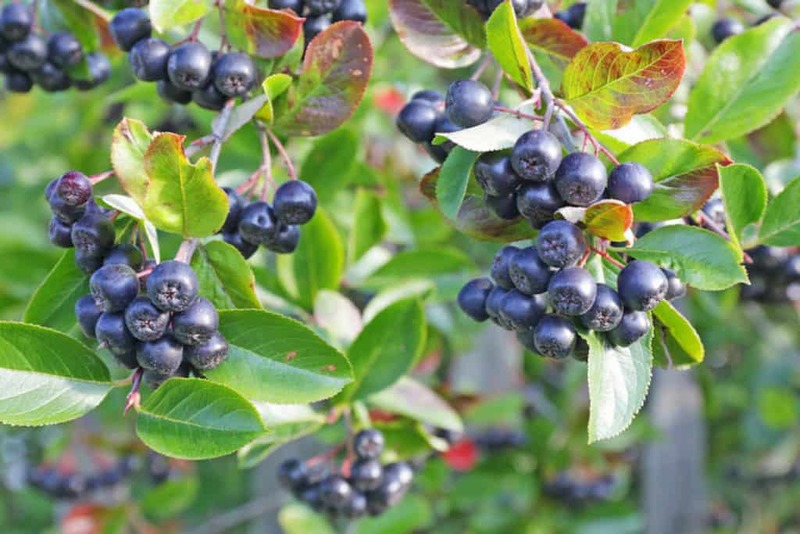 Chances are very good you’ve never eaten aronia berries, but that should change. Also called chokeberry, the fruit of this easy-to-grow deciduous shrub aren’t the best for fresh eating, but are excellent in various preserves. I grow the Viking variety of aronia, which is bred for palatability, so the berries aren’t as sour as the fruit from more ornamental aronia plants. The dark purple, nearly black berries grow in easy-to-harvest clusters. They are firm and puckery, with a black currant sort of flavor. Like many dark-pigmented fruits, aronia is positively bursting with anti-oxidants and various disease-fighting phytochemicals. I am cynically waiting for the $40-a-bottle aronia extract “super food” supplements to hit drugstore shelves everywhere. Mark my words, it’s only a matter of time before aronia gets to goji-berry treatment. Buy your aronia shrub now and beat the hipster rush. 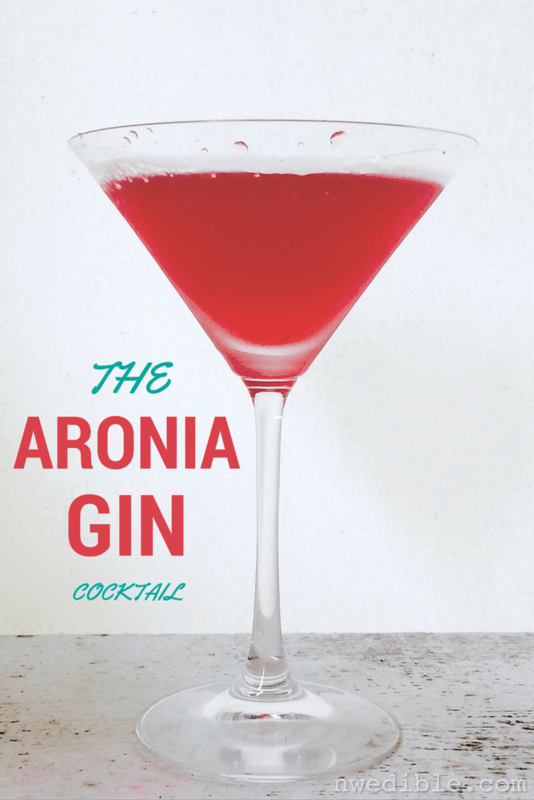 If you want to make the Aronia Gin Cocktail, you’re going to need Aronia Simple Syrup. Bring everything to a simmer over medium heat, and simmer until the berries burst. Keep simmering until the syrup is reduced by about half. Strain the syrup and allow to cool completely. 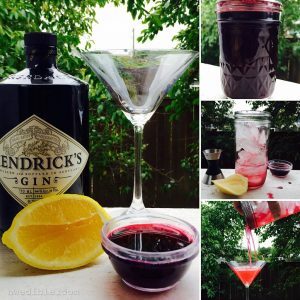 You’ll need aronia simple syrup, gin and fresh lemon. If the aronia syrup just isn’t gonna happen, you can substitute blackcurrant syrup or Crème de cassis for a similar cocktail experience. 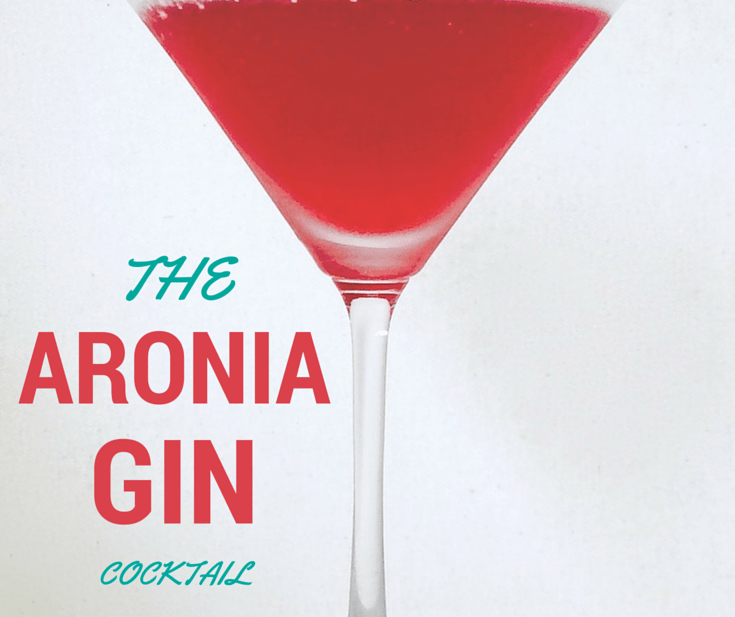 A traditional gin cocktail made uniquely delicious and wonderfully pink with Aronia. 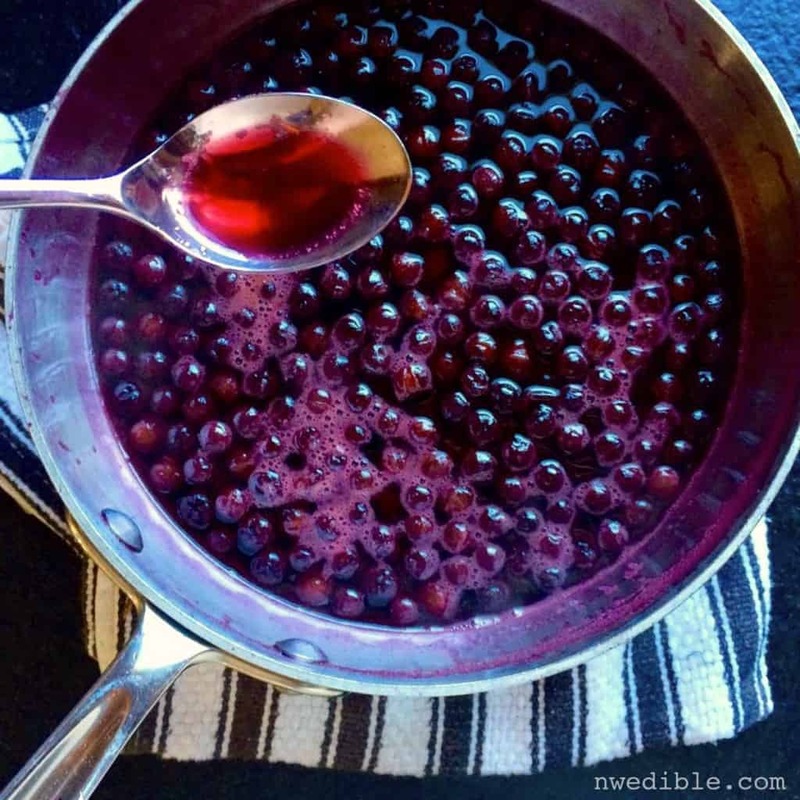 Add the aronia berries, sugar and water to a non reactive saucepan. Bring to a simmer over medium heat, and simmer until the berries burst. Keep simmering until the syrup is reduced by about half. Strain the syrup through a fine mesh strainer. Allow the syrup to cool completely before use. Fill a shaker with ice. Measure the aronia syrup, lemon juice and gin into the shaker. Cover and shake the cocktail hard for 15 to 30 seconds, then strain into a chilled cocktail glass. Sorry I’m not sure how to show pictures in the comments (if it’s even possible), but here’s a couple of Google Photos. It was in the backyard when we bought the house. The berries don’t taste horrible.. slightly astringent.. just more pulp than juice. Yeah, that sure looks like aronia to me. The leaf shape looks right, the berries are growing in clusters, and your description of the berries is consistent with mine. The berries in your photo look a touch shinier than mine, but that could be the photo. I’d take a sample of the leaf and berries to your local nursery and have them ID it for sure before eating it in any quantity – there a quite a few shrubs that have black berries, and a few of them are toxic – but you may very well have aronia growing in your backyard! Edit: Found this, it might help you make a positive ID. The Aronia melanocarpa shown here is referred to by a common name, Black Chokeberry. I’m pretty confident it’s Aronia, but your idea to take it in for a positive ID is a good one.. plus, it’s another excuse to go to Flower World. Harvested some berries this morning and worked on the syrup. I lightened the sugar load by putting about 1/4 part sugar and added a bunch of raspberries. I’ll probably wait to try it after the positive ID. Just call me the enabler. Oh, so glad to see you’re into aronia! I’ve have a shrub forever, and just now got up the nerve to prune it.. it got a primo sun location that is over it’s pay grade, at this time. But, it prunes beautifully! tips it’s hat, and proceeds to ‘correct’ my ‘mistake’ 😉 And so pretty! … astonishingly lovely clusters of large, white, apple-blossom shaped flowers in spring; easy to pick (by me and robins) in summer; and stunning red foliage in fall… I often, for a nanosecond, mistake it for another very late flowering. So glad to see it get it’s due. And the nutrition!! (Wish I could remember the cultivated variety that it is… from Raintree or Burnt Ridge, for sure 😉 A thought… wonder if I could make an multi-useful simple syrup from aronia.. and the goumi and seaberries .. (and honey berries?) …. talk about healthy! Long ago(maybe ten years?) Costco had an aronia berry juice coctail blend and I loved it. Yeah it tons of added sugar but it was awesome. I’ve been looking for it ever since, even planted a couple shrubs because I knew I loved the flavor. Maybe next year they will actually produce more than 6 berries and I can try this as it looks scrumptious and slightly girly 🙂 . Ok, I’ll call you Enabler. Looks like I need to get one of these shrubs before the hipster rush. (Love that, btw.) Till then I’ll try your drink with my blackcurrant syrup. For a counter-opinion, none of us liked the aronia berries we tried. I really wanted to like them since they are soooo nutritious and my CSA was selling them on the side. When we tried them, my daughter said, “these don’t taste bad but they are making my mouth feel really dry.” I countered that they weren’t really for fresh eating and everything is good in a simple syrup. But I made up the simple syrup and mixed it with fizzy water (my usual route for currants, wild grapes, berries) and we were both like “how can our mouths feel so dry with all this water?” I don’t know if it was the variety… or us… or ??? Perhaps I should have added the gin?? I have 8 of these shrubs thriving in my northern yard. They were chosen because the fruit is edible and it’s native to my area. We make jelly and preserves every year and this year I made syrup with the juice. Each shrub yielded a five gallon bucket of fruit(it was a very good summer) and I had to think of something else to do with it. I also ended up leaving a bunch on the bushes because the birds and our meat rabbits happen to love it. I can’t wait to try this cocktail with some of the syrup I just canned. It’s as if you read my mind as I stood there looking at all the jars and wondering what the hell I was going to do with it all! This sure looks like the branches leaning over our fence from the neighbor’s yard. The huge crop of berries this year had me wondering if they were edible, especially since the birds got all the berries from our blueberry bush that’s on our side of the fence. And now there’s a recipe to go with them! If that’s what it is, of course. I’ll have to have it checked out to be sure.